We specialize in affordable, casual events, celebrations, and meetings. 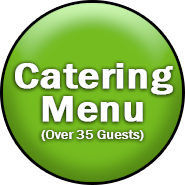 For over 35 guests, you can pick up at our convenient kitchen. Delivery and set-up are available for orders over $350. And for our non- profit customers…. Eat Better, Be Better, GIVE BETTER! 5% discount on Calypso Kitchen orders for non-profit organizations with cash or check payment!